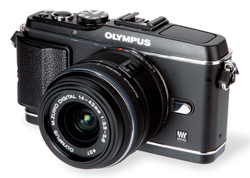 Despite there being no increase in resolution from previous models, the Olympus Pen E-P3 does have a brand-new sensor. The 12.3-million-pixel Live MOS sensor produces 4032×3024 images in either its native 12-bit ORF raw format, JPEG, or both raw and JPEG simultaneously. This means a 10x13in image can be produced at 300ppi without resampling. The sensor outputs data to the processor at twice the rate of the older sensors, providing 120fps compared to a previous 60fps, which helps focusing abilities through the frequency acceleration sensor technology (FAST). This is not related to the available continuous shooting speed, though, which remains at 3fps. The ISO range has been increased at the top end to reach 12,800 compared to a previous 6400 when high ISO is made available from the custom menu, but by default it retains a standard ISO 200-1600 range. The sensor is twinned with a new processor, the TruePic VI, which is a dual-processor unit to cope with the increase in data. Video-capture abilities have been bolstered to record in 1920×1080-pixel 60i HD, which are saved in the AVCHD format, although AVI format is selectable for 720p HD recording. The E-P3 offers a choice of metering modes with its 324-zone system, including ESP evaluative, centreweighted and spot, plus highlight and shadow. Exposure compensation gives ±3EV and bracketing can be set for up to seven frames. The focusing allows a selection of up to 35 points – increased from 11 on the E-P2 – and touch focusing selection on the rear screen. It also offers extended face-detection control with eye-detect settings for left, right or nearside priority. For moving subjects there are focus tracking and continuous focusing options, plus full-time AF, which must be activated for the fastest focusing abilities. Manual focusing is aided by a focus-assist confirmation and an enlarged view while focusing. Anti-shake is built into the body of the camera by stabilising the sensor, as is dust reduction in Olympus’sown Super Sonic Wave (SSW) form. The micro four thirds mount now includes 11 lenses from Olympus and 11 from Panasonic, while Sigma is expected to release its own versions in the near future. By using Olympus’s own adapters, you can also fit four thirds and OM-mount lenses. Art filters have featured across all previous Pen models and the more recent Olympus DSLRs. Although initially the effects were very much a one-trick affair, recent versions have added more control to the user. The E-P3 features ten art filters and most allow a choice of secondary presets or the addition of borders or other effects. The cross-process filter, for instance, allows you to add a pinhole effect to create Lomo-type pictures. The rear-selection dial in the art shooting mode now remains active, allowing you to adjust the aperture for greater creative freedom. The camera also features a set of 23 scene modes, including a 3D mode that allows you to take two images to produce the effect. There’s an iAuto mode for simple point-and-shoot use, and the usual arrangement of manual, program and priority exposure modes for creative shooting. For the first time in a flagship Pen model, the E-P3 features a built-in flash, which pops up from the top panel when the flash button is pressed. This has a guide number of 10m @ ISO 200 (GN 7m @ ISO 100). It offers auto and manual power control, slow synchronisation, redeye and second-curtain options, and there is also support for hotshoe and wireless flash control of up to four channels and three groups using the FL-50R, FL-36R or FL-300R units. Storage is in the form of an SD memory card, with both SDHC and SDXC formats also supported. Using a SanDisk Extreme Pro SD card, the camera takes roughly 1sec to write a JPEG and 1.5secs to write a raw file (2secs for combined raw+JPEG). In continuous shooting mode it can maintain the 3fps for 11 raw files or 27 JPEG images before slowing.